This is a complete set of white plastic Architrave speaker wall plates for a 5.2.1 surround sound systems, the set consists of X1 double gang 5.2.1 Dolby Atoms Speaker Plate and X3 architrave speaker wall plates and X2 Single Gang Dual Speaker Plates intended for the front Left / Right & Atmos Speakers all on a White blanking plates. The plates feature screw terminals on the back for easy connection of the speaker cables as well as screws for the back box. 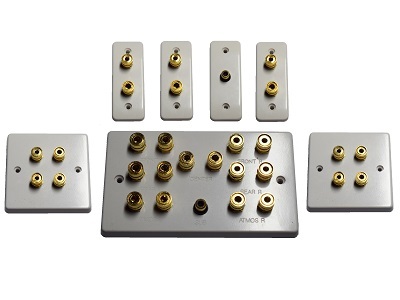 The connection plates have in total twenty eight gold platted binding posts that also accept 4mm banana plugs should you wish to use them.